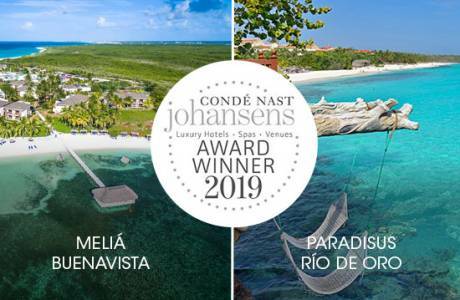 The Meliá Buenavista and Paradisus Río de Oro hotels received the Condé Nast Johansens Award for Excellence 2019 for the region of Canada, United States, Mexico and the Caribbean. Meliá Buenavista was chosen as the best hotel for weddings, parties or special occasions and the Royal Service Paradisus Río de Oro was selected as the best hotel with a spa. The awards given by this multimedia guide are one of the most important worldwide acknowledgements of quality in the travel and tourism industry. Nominations are a result of online voting, guest quality surveys and the assessment of the international team of inspectors. Meliá Buenavista, in Cayo Santa María, is one of the most appreciated hotels in the archipelago and one with the most awards. A special place for guests seeking privacy, isolation and exclusive service. Its 105 rooms have The Level category. This concept encompasses superior comfort accommodation and sophisticated elegance: butler service for every guest, private beaches, Yhi Spa and à la carte restaurants with a full fine dining menu that includes the best flavours of international cuisine. Several kilometres of beaches, unspoiled coves, a wide strip of fine white sand, crystal-clear turquoise water, lush vegetation and its own extraordinary native wildlife make this place an oasis of calm and relaxation. The chance to enjoy the exclusivity Meliá affords in the middle of a biosphere reserve. In an outstanding location in a large area of beach, this is one of the best all-inclusive adults-only resorts in the luxury sector. A small paradise on the north coast of Holguín. The establishment, with 354 rooms, stands out due to its personalised service and privacy, especially in the Royal Service section, considered an exclusive hotel within a hotel. This area overlooks an impressive coral reef rich in flora and fauna and it affords maximum comfort and privacy. This isn’t the first time that Condé Nast has recognised the excellence of Meliá’s amenities in Cuba. Year after year, these hotels are listed among the best in the world.